Marvin Nathan '66, left, University of Houston Law Center professors Johnny Buckles, James Nelson and Geoffrey Hoffman, Rabbi Steve Morgen, Deacon Sam Dunning, Pasto Emmanuel Jackson, Joe Bradfrod, Lauren Jones and Dean Leonard M. Baynes, right. 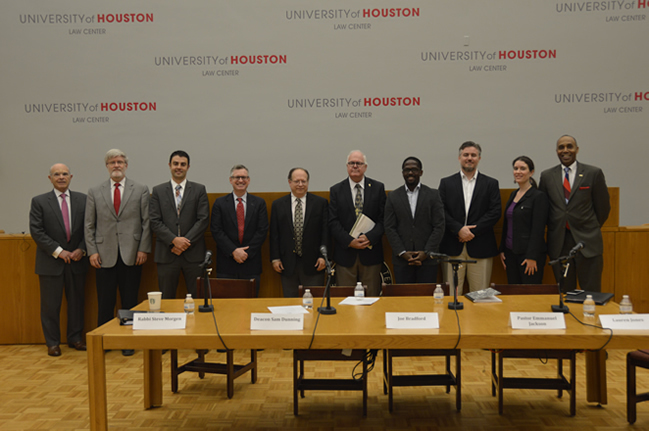 Oct. 30, 2017 -- The University of Houston Law Center and the Anti-Defamation League co-sponsored "The Effects of Immigration on America's Local Communities," an event consisting of three panel discussions that focused on interplay between religious scripture, law, and public immigration policy recently in Krost Hall. "When I think of the Anti-Defamation League, I think of a great civil rights organization and its message of standing up to hate is so pure," Dean Leonard M. Baynes said. "The Law Center has a long relationship with the Anti-Defamation League. One of our most prominent grads, Marvin Nathan is the national chair. He sponsors fellowships every year where Law Center students get to work at his great organization." Marvin Nathan, national chair of the ADL and a 1966 alumnus of the Law Center, illustrated how the ADL's message still rings true and referenced violent white supremacist demonstrations that occurred Aug. 11-12 in Charlottesville, Va., where one counter-protester was killed. "I'm forever grateful to the Law Center for educating me, enhancing my legal skills and making me a lawyer that is always engaged in what is equal justice and what is wrong," Marvin Nathan, said. "It's a privilege to be here and I'd like to thank the Law Center for helping the ADL host this event and applaud its integrity and credibility." The first discussion provided a current overview of immigration and featured Lauren Jones, ADL civil rights national counsel, and Geoffrey A. Hoffman, a clinical associate professor and director of the Law Center's Immigration Clinic. Jones primarily works on a number of different civil rights issues including voting rights, criminal justice reform and women's rights. She said she has seen a sharp increase in immigration work in the past year in what seems to be a constantly changing situation on a national level. "For those of us who work in immigration policy and for those who are lawyers it's really hard to keep up with what's happening," Jones. "But I always keep in mind for immigrants whose lives are directly impacted by this it's even more confusing and dramatic." Hoffman shared Jones' sentiments, and said immigration laws tend to be altered frequently. "A quote from (philosopher) Meister Eckhart I like to use is, 'be willing to be a beginner every single day,'" Hoffman said. "Practicing immigration law can make you feel like a beginner every day. It's changing on a daily basis and it's a very fast-pace practice for my students and I." The second panel, titled: 'Law, Religion and Public Policies,' included Law Center professors Johnny R. Buckles and James D. Nelson. Buckles pointed to certain books in the Bible that show a complex history between law and theology. "I've noticed a common theme in multiple passages -- some in Deuteronomy, some in Leviticus, some in Numbers -- a provision for the hungry," Buckles said. "Special treatment of the vulnerable, including immigrants, pervades the law." Nelson pointed to contrasts between law and religion, referencing the 1971 Supreme Court Case, Lemon v. Kurtzman In an 8-1 decision the Court ruled for a law to be considered constitutional under the Establishment Clause of the First amendment, it must be nonreligious. "All government acts must have a secular purpose," he said. "Government acts must be supported by reasons that are not fundamentally religious or theological in nature. This basic fundamental constitutional principle comes to us from the famous Lemon case and the first part of the Lemon test." The final discussion, a 'Religious Perspective on Immigration' featured Joe Bradford, a Muslim legal scholar, Deacon Sam Dunning of the Roman Catholic Archdiocese of Galveston-Houston, Pastor Emmanuel Jackson, of the Living Word Lutheran church in Katy and Rabbi Steven Morgen of Congregation Beth Yeshurun in Houston. The session concluded with a question and answer session. Attendees received 2.5 hours of continuing legal education credits, including a half hour in ethics.